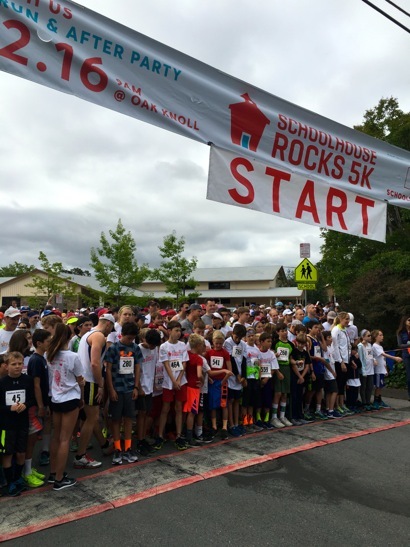 Photographer Laura Hamilton – and Menlo Park parent – sent photos of this morning’s Schoolhouse Rock 5K run, which took off from Oak Knoll School and raised money for the Menlo Park City School District. Laura (white visor, kneeling) participated with a Girls on the Run team from Laurel School. Over 1,400 runners and walkers participated. Encinal’s Nicholas Keller was the fastest teacher with a time of 23:21:2. Jonathon Bunt achieved fastest overall male with a time of 17:52 minutes, fastest overall female was Tori Borish with a time of 19:49:6 minutes.